Inflatable hot tubs are all the rage lately. They are more affordable and hold many of the same benefits that stationary hot tubs offer. This makes them very appealing to those who can’t afford or aren’t willing to invest in a hard hot tub. Many companies are getting in on the action as the demand for these convenient hot tubs continues to increase. One of the largest of these is Bestway. Bestway offers a large line of inflatable hot tubs that range in size, color, and style. This company has extensive experience with inflatable items, including a marine certified inflatable boat. This is a company that definitely knows what it’s doing when it comes to this industry. When you’re planning on investing money in an item like an inflatable hot tub, you want to be assured that it will last longer than a weekend. If you have children or pets, you want to be sure it is going to be tough enough to withstand the beating it will most likely take. You want to know that you will get your money’s worth out of it, so you don’t end up feeling as though you threw money away on junk. A great inflatable spa will be able to last for a long time even if it is used on a daily basis. One of the benefits of a portable hot tub is being able to use it both indoors and outdoors, depending on your preference and the weather. An exceptional inflatable hot tub will be able to withstand cold temperatures, but even those that cannot still have the benefit of being used year round if brought inside. This is also a bonus if you have a heavy rainy season where you want to be inside rather than outside. A stationary hot tub can’t be picked up and moved on a whim, so this is the biggest area where inflatable hot tubs have a distinct advantage. The Bestway SaluSpa Palm Springs AirJet Inflatable Hot Tub is a plug and play model that can be plugged directly into a standard outlet. It seats up to six adults comfortably and holds up to two hundred and fifty-four gallons of water. It features a rapid heating system that heats the water up to one hundred and four degrees Fahrenheit at a rate of two to three degrees per hour. The hot tub has a digital control panel that controls temperature, the Lay-Z massage system, and the built in filtration system. This panel is conveniently located on the side of the tub, so you don’t have to get out of the water to make adjustments. The exterior of the spa is tan, while the interior is a basic white. 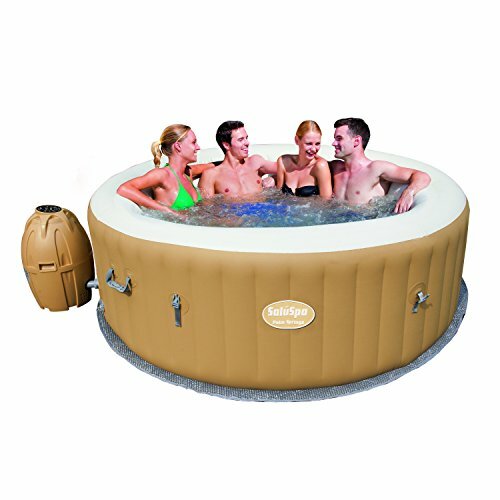 This inflatable hot tub comes with a cushioned air mat to go under the tub, a locking cover, a chemical floater, and an extra filter cartridge. Bestway’s Palm Springs model has a higher water capacity than many other inflatable hot tub products, which gives you more room to stretch out and enjoy the soothing water. It allows you to sink in to the water, so you can have the warmth and bubbles embrace your entire body, rather than just the lower half. This extra room also makes it more comfortable if you’re trying to accommodate the maximum of six adults, though it’s still a bit crowded. The Lay-Z massage feature is another great benefit of this portable spa. It provides a light massage that helps you relax after a long day. While a few customers expressed a wish for hotter water, they also said they were more than satisfied with the maximum temperature. They also said this temp made it possible to spend more time in this hot tub than they would be able to spend in a stationary hot tub. This allows for an even longer and more enjoyable relaxation experience. Bestway unfortunately does not have a great track record when it comes to customer service. Some customers had no issues getting through and having their issues taken care of. However, many other customers were unable to even get a hold of a representative and never received a call back or returned email. Bestway offers a warranty, but it won’t do you any good if you can’t get in touch with the company. The Bestway SaluSpa Palm Springs AirJet Inflatable Hot Tub is an inexpensive and reliable option for those who are looking for a relaxing spa experience at home. While it is not the best option, it certainly ranks among the better inflatable hot tubs that are currently available. It will have no problem getting the job done. Jeanne runs the pool section of OutdoorAuthority. When she isn't training for her next triathlon, you can find her demoing the latest pool gear and writing how-to guides to make your next purchase a breeze.